With the required continuing education for practitioners, a great deal of the available offerings focus on ethics, skills, modalities, or new information gleaned from research. One’s professional development can resemble graduate course work, and this type of learning can be predominantly informative or horizontal in nature. In addition, with the number of therapies in the hundreds and growing, and the demands for evidence-based practice, what seems lost is that three decades of empirical research finds that, other than pre-existing client characteristics, individual therapist differences and the therapeutic relationship are the most robust indicators of outcome. Therefore, it makes sense to continuously develop the instrument of influence: the self. Horizontal growth is additive and one-dimensional, while vertical growth encompasses the whole self as a person in process. Transformative growth involves more than what to do in the therapeutic process. If we are to meet clients where they are, we must first know who and where we are. This process is lifelong and includes learning and adapting personally and professionally. Vertical growth honors the tenets of developmental theory that suggests that, at some point, for adults, growth is optional. This freedom of choice matters for research reveals a full 58 percent of the general population who have not developed to the point of self-authorship and conscious responsibility for one’s inner life. Further, principles of vertical development establish the following: each stage of development is qualitatively different; we have the potential towards deeper understanding, wisdom and effectiveness in the world; the depth, breadth and complexity of what we can notice can increase with development; and our capacities for dealing with complexity increase while our defenses decrease. Vertical development is the on-going process of bringing subjective being into objective awareness. Uncovering the psychological structures that give rise to our way of knowing is an intentional process, as we willingly examine our choices, beliefs, and actions. 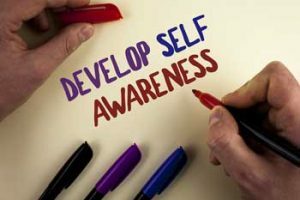 The stages and transitions of adult development are well-described and provide the path to higher levels of self-awareness. 1.Reflective practice. Planning time in your day to observe your thoughts, feelings, and actions regarding significant events is a powerful tool. Commit to making space between the actions and the outcomes and notice the process. Are you present? Are your roles balanced? Is there reciprocity in your relationships? How are you making meaning in your day-to-day life? Consider the emotional and motivational aspects of your choices. Examine assumptions: Our minds take a lot of shortcuts and often we react from habits, values, and beliefs that haven’t been examined in a while. The cascade of “Why?” questions is a great exercise to clarify if we are acting from principles or need to look at our perception in a new light. Also, rigidity is a sign that assumptions and expectations are blocking a wider view of a particular situation. Set developmental goals: The gap created by these goals creates discomfort for they involve examining our sense of identity. A developmental goal involves increasing your capacities at the boundaries of who you are and becoming more able and aware. These goals spring from the basic needs of autonomy, belonging, and competence, and are the fundamental motivation for self-determination. If you work in a system (such as public mental health, university, etc.) or are not too far from your formal training, developmental goals include inquiring what you have psychologically accepted in these settings without question. Developmental goals require ownership for your internal life and authoring your sense of self. These goals require you to ask the challenging questions, such as: What is it like to be in a relationship with me? How can I add more value in the work I do? How am I meeting my needs? How can I take more ownership of my time? Challenge your mindset: If we do the same things each day, with the same people, we tend to get locked into a particular mindset. A growth mindset focuses on improvement, effort, and attitude rather than talent or fixed abilities. There are numerous ways to expand and challenge your thinking: learn a new skill; read something outside your field; think systematically about a challenge you are facing; enlist a mentor or coach; start a new hobby; volunteer; mentor. Changing roles or taking on a new one, even short-term, is a powerful way to expose aspects of your current mindset. Integrate self-awareness: Just as we try to help clients create a coherent narrative, there is nothing more powerful than making sense of our own lives. Being clear on who we are, where we came from, and where we are heading, is the ultimate in vertical development. This process highlights the flow of personal differentiation and integration based on a deeper understanding of our story. Journaling is an effective way to monitor and explore this process. Whether you choose one or many of these vertical paths, you are sure to find as you grow, your capacity for the demands you face grows as well. It’s a process that requires consistency and time, for you are pushing the boundaries of self, and riding the cycle of complexity to simplicity—and back again. Vertical growth introduces us to the edges of our current way of knowing and how we construct meaning. Committing to reflecting on the challenges, assumptions, and actions at these boundaries, opens the door to the wider lens of vertical development.